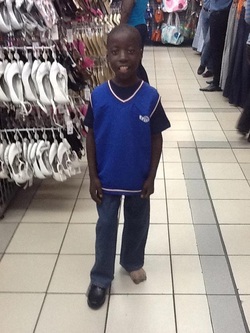 Elisha is a quiet 10 year old, single orphan. Elisha's biological father died when his mother was pregnant with him. He lives with his mother and his stepfather. Elisha's mother says that the stepfather does not provide Elisha with much support because he is not his son. His mother does not work. Elisha has an older sister who attends Bauleni Basic School, which is a government school. Elisha does not attend Bauleni Basic, because the mother says that he refuses to go (he likes Appleseed.) And, the family can not afford the required uniform for Bauleni Basic School. Elisha had a little sister, she died a few months ago, she was 4 years old. The family does not know the cause of her death. They say that she cried all day and while the mother was walking with her to the medical clinic, she died in her arms along the way. Elisha's mother is very grateful for RHO Appleseed School. She hopes that Elisha can continue to receive nutrition and a good education from us.